I’m writing this blog post just one hour before my last class of the semester. It seems crazy that in just under a couple hours I will officially be able to say I finished a semester in Chile. Although my program won’t end for a couple more weeks, the 5th of July to be exact, I will be done with all my work for classes here after today. Looking back on the semester, I can see how much I’ve grown from my first day here. Over the last week or so, I’ve really noticed these changes and started to reflect on how I felt in those first few weeks and how I feel now. Language is the obvious area where I have noticed myself grow. When I first got here, I could understand more or less. But a lot of times I really struggled to know what was going on, especially in my house during meal times. In class when I didn’t understand what the teacher said and when all the other students would nod their head with the look on their faces that they had understood perfectly well what had just transpired, I wouldn’t speak up and say that I didn’t understand. Even though I realized that sometimes in classes in English, I would need to ask questions to clarify, I felt that if I asked a clarifying question, I would come off as stupid. But now, I don’t hesitate to ask a question if I don’t understand a word or need more explanation. Although I’ve noticed I need this explanation less and less, because my listening skills have improved immensely, I no longer have a fear to admit I have no idea what’s going on. I know that if I speak up, I will learn something new and also feel more included in the conversation. Along with my newfound acceptance to ask questions, I’ve noticed that I no longer have a fear to speak the language, especially in front of a group. During orientation, I basically said absolutely nothing when we were together as a group, scared that I would make mistakes, and knowing that my Spanish was far worse than a lot of the group. In classes, I wouldn’t say much and for presentations I would be extremely nervous, practicing so much and still having butterflies in my stomach when I actually had to present. Now, I talk in all my classes a lot and really like participating. The last couple of presentations I had, I noticed that while I was still a little nervous right before I went up, I could speak fairly fluently with little practice and I felt much more confident about my speaking skills in general. This really showed when we had an oral test the other day where we received a topic 5 minutes before we would have to present on it. With three professors sitting in front of me, ready to evaluate every mistake I made, it seemed like a really intimidating situation; but I answered all the questions more or less seamlessly and walked out of the room feeling overwhelming confident about my performance. I realized that I no longer have to think about how to conjugate my verbs or think long and hard about how to say something, but rather only what I want to say. Such a difference from the beginning of the semester! Obviously, I still have a lot to work ahead to become fluent in Spanish, but the improvement I have seen over the semester has been outstanding. With this newfound confidence in language, I’ve noticed that my confidence in everything in my life has boosted. When having to communicate in a second language with people you don’t know, I feel like you really have to put yourself out there and really embrace all your failures and mistakes. At the beginning of the semester and even back at Puget Sound, I would consider myself an outgoing person but I wouldn’t necessarily be extremely talkative around someone I didn’t know very well. For example, at a party or an event where social mixing is expected, I wouldn’t go up to random group of people and introduce myself and attempt to make friends and interact. This Saturday though, I went to birthday party of one of the girls on my soccer team and I didn’t really know anyone. Yes, there were a few other girls from my team there, but for the first hour or so it was all people I didn’t know. Usually, I wouldn’t even go to one of these parties alone, and second of all I wouldn’t take the initiative to talk to people I didn’t know, especially when they all knew each other already. However, I took no hesitation to introduce myself to almost everyone at the party and converse with several different groups of people. 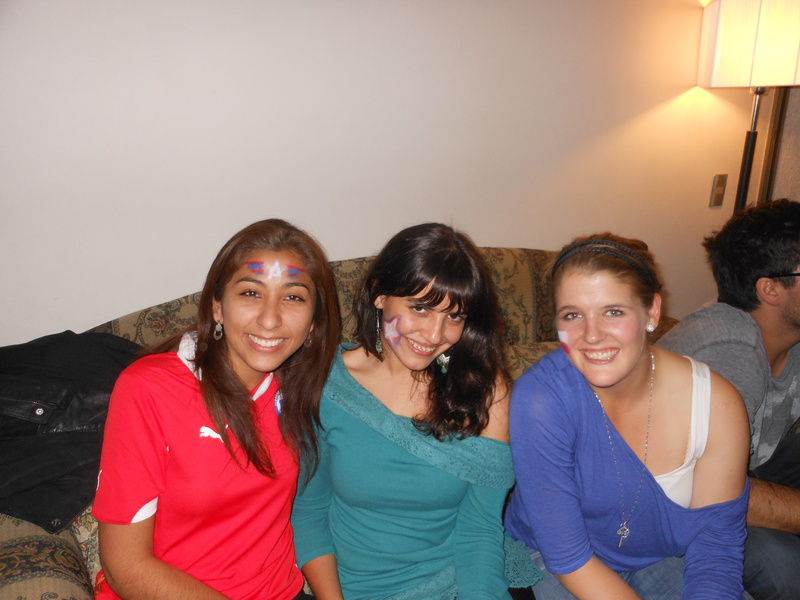 It ended up being one of the best and most memorable nights I have had in Chile. It was a night where I really saw how much I have grown in my time here and was able to reflect on some of the great friends I have made here as well. As my classes begin to come to an end and my program winds down, all my friends are getting ready to enjoy their last couple of weeks in Chile and then head home to the States. However, earlier in the semester, I decided that I wanted to really take advantage of my time here and thus, I have decided to stay in Chile for an extra month after my program ends, hoping to get a volunteering job in a health center or hospital to learn more about the treatment of patients here. Over the past couple of weeks, I have been emailing different organizations and hospitals furiously to see how and what I could do during my month here. While I haven’t found anything concrete yet, I’m hopeful that something amazing will come and that this month will allow me to grow and learn even more. The transition from classes to working will be interesting one. I will be moving out of my host family’s house in about 2 and half weeks, which I am absolutely not excited for. While I will be moving into the house of one the girls on my soccer team, which I think will be a very fun experience, I’ve become very close to my family here and I’m very sad to have to leave them. I’m sure that we will still get together during my time here, but it will be a change to not see them every day. Also as all my friends from my program leave to go back to the States, I feel like I will lose a little of the support system that I have built while I’ve been down here. As they leave, I’m hoping that I will be able to weave myself even more into the Chilean culture, as I won’t have my fellow gringos to remind me of my American culture constantly. This month will bring a lot of new challenges, but I’m ready to face them with my new confidence, not only in the language, but in myself as well. Watching one of the soccer games with my Chilean friends, Caro and Jenny. Through these friends, I’ve learned a lot about myself and gained the confidence to converse in a second language and be more open in social situations. This entry was posted in Uncategorized and tagged #growth #beginningofanend #transition. Bookmark the permalink.